"These are great when you want homemade goodies but don't have the time to make them. 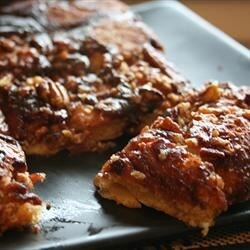 I sometimes use flaked coconut instead of the pecans for a different taste!" Great quick recipe for moms that don't have alot of time! I lowered my oven temp. to 425 and baked about 12 minutes. The buns were both soft on the outside and inside. Delicious! I used two cans of biscuits in a round pan. These were fast and delicious. I drizzled with maple syrup instead of corn syrup. Thanks for a great recipe! Very good. Great recipe for someone who really doesn't have a ton of time to make these from scratch. Thanks for a quick, easy, and sweet treat.